President Ramaphosa has stated over and over again that South Africa is open to business. I guess he should have mentioned that Ts and Cs apply, writes Howard Feldman. I do not represent the Jewish community. I sit on no boards, and do not have an official (or unofficial capacity) that empowers me to speak on its behalf. I further am not employed by Israel, have never been a member of the IIDF (Israel Defence Force), and given my flat feet and exercise induced asthma, I most likely never will. I am also way too old. Why do I list the above? Because in my experience, South African Jews who object to the country's policy towards Israel are automatically asked these questions. As though our opinions need to be qualified before they might be considered in earnest. I host a daily morning show on Chai FM and given the listenership, that includes a diverse range of South Africans, I am well placed to gauge the immediate responses to any issue that I raise. Today, we spoke about you and your foreign policy. In a now well published interview, you stated that South Africa has "no relationship with Israel". You have downgraded the embassy to a liaison office and will continue along this path. You are of course fully entitled to say whatever you want, but you need to understand the damage that you are doing, not to Israel, but to South Africa. South Africa is already known for its suspect and inexplicable relationship with terror movement Hamas, who coincidentally shares an office in Cape Town with the BDS movement. In case you leap to the "one man's terror group is another man's liberator" argument, I urge you to read the Hamas Charter that openly calls for the murder of Jews. Sadly, Jewish history has taught us that when people say that they want to see us dead, they generally mean that. Further, as it's your responsibly to be aware of this, you also know that Hamas routinely throws gay people off buildings, that they allow very little freedom of any sort to the people that you think they are liberating. They have recently violently quelled protests in Gaza, and yet, try as I might, I can't seem to find your statement about this. You have not downgraded your relationship with Iran, global sponsor of terror, with China, a country known for its human rights abuses and for setting up "re-education" camps for a million Muslims. You have used "quiet diplomacy" towards the despotic leader of Zimbabwe while our fellow Africans starved, and you have been unacceptably supportive of President Maduro of Venezuela. Your friends in Cuba have created an environment where the average Cuban lives on USD20 a month, and yet you laud this relationship. Strangely, this is not even about Israel. That small young democracy has become a powerful force in almost every area, despite the odds. Many African countries are seeing huge benefits from embracing its technology and aid and Israel is making great strides across the continent. So too have countries in the Middle East who recognise not only the value that Israel brings but also the resistance of Hamas and the PA to make peace with their enemy. Frankly, you are anachronistically out of step with the rest of the world. You realise of course that Israel will hardly notice the downgrade? South Africans will. This is more about South Africa and the economic and reputational damage that it will endure than it is Israel. Should they choose to continue what you have started, 22 000 tourists will no longer visit South Africa each year. This represents the greatest number of tourists from the Middle East. Translate that to the number of jobs that will be lost in South Africa and we have something tangible to start with. Israel buys 10% of South Africa's diamonds (estimated at around R2.5bn) and coal to the value of R2bn. South African farmers purchase fertiliser and chemicals, we use medical and electronic equipment from Israel (think of the medical stent) that is developed and produced in Israel and cooperation could undoubtedly solve so many of our problems if we allowed it to. President Ramaphosa has stated over and over again that South Africa is open to business. I guess he should have mentioned that Ts and Cs apply. Of course, we know that your attitude towards Israel has never been particularly balanced. As early as January 2008 you stated, "Unfortunately the Embassy of Israel is not in the Dead Sea, it's very much in Pretoria." What exactly did you mean by this? That Jews should be drowned? This eerily echoes the chant of Hamas who too demand that "From the river to the sea Palestine will be free (of Jews)." Your obvious bias and blatant hatred needs to be checked, with respect. I understand well that the ANC has a desperate need to present itself as a liberation movement. Former president Jacob Zuma's "white monopoly capital" courtesy of Bell Pottinger created the construct of the "enemy" within, and that South Africans needed liberation from it. And now you seek the next villain. Perhaps you think that by diverting attention to Israel, it will stop the country noticing the failures of the ANC as a ruling party. But South Africans do notice and we know well that you enforce this hopeless strategy at the expense and to the detriment of the people of this country. If you and the ANC are looking for people to liberate, perhaps you should consider the average South African who has been subject to your capture for way too long. 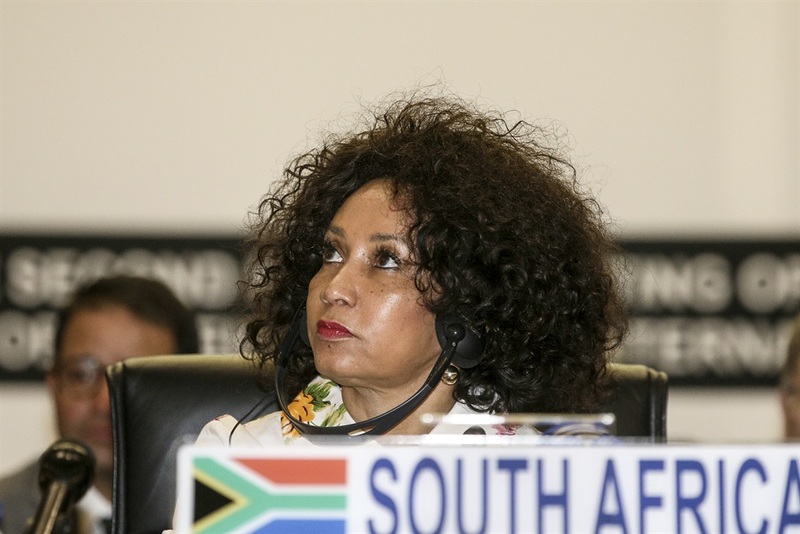 Ms Sisulu, South African Jews have long contributed significantly to the country. I have no intention of listing the specifics but there is not an area, whether it is charity and outreach, medical, education, law and business that they have not positively affected. The number of South Africans employed by Jewish business is almost without parallel. I further do not need to list the number of Jews who sacrificed so much for the struggle because it's your job to know this. You betray this community at the country's peril. On my show this morning I argued that tough dialogue is better than no dialogue. Listeners actively advocated a "boycott" of the ANC and a cessation of all contact. I do not agree and am convinced that by doing so, we will simply make it easier to pretend that our voices do not exist. But I was almost alone in this approach. In this spirit, I invite you onto my show in order to have this difficult conversation. Let's spend some time having this dialogue and let's prove to South Africans that you indeed have our best interest at heart.